It is our goal at Veazie Veterinary Clinic to provide the best veterinary care and service to our clients and patients. Unlike a human hospital, our facility is maintained by a veterinarian without any governmental aid. Therefore, we must charge for all of our services as well as for any medicine, supplies and hospitalization. We believe appropriate diagnostics will lead to a more successful treatment and, ultimately, a quicker resolution of your pet’s illness. We often do not charge more per service item; instead we perform more services per visit. Payment in full is required at the time of service. Deposits are required for most hospital admissions and some procedures. For your convenience we accept cash, checks, debit cards, American Express, Visa, MasterCard, Discover and Care Credit. We can provide itemized estimates for all proposed procedures. We provide an itemized invoice after each visit. We always encourage discussion of financial concerns prior to procedures and treatments. 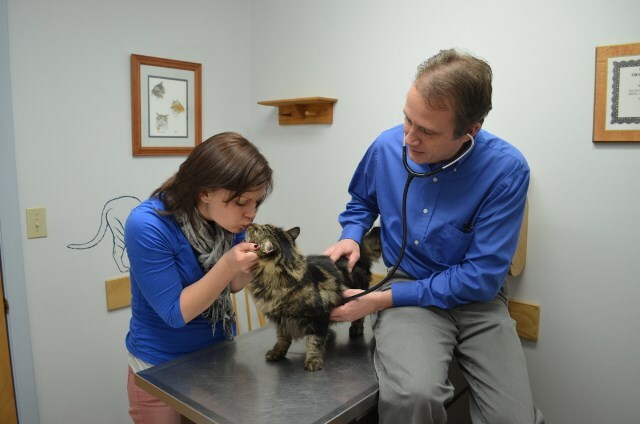 If you have any questions about the cost of care for your pet, please call us at 207-941-8840. Care Credit is a personal line of credit for many healthcare procedures. It can be used for both the human and animal members of your family. It is easy to apply online, and you will usually know whether you are approved within a few minutes. You can also apply in our office. NOTE: The extended payment plans and options posted online at carecredit.com may differ from those available to Veazie Veterinary Clinic. The payment plan information provided to you by Veazie Veterinary Clinic is the accurate representation. We will give you personalized payment plan information when you use your card at our practice. www.RedRover.org — Provides financial assistance for owners struggling with economic hardship and domestic violence. www.BrownDogFoundation.org — Offers grants to owners whose pets have life threatening illnesses and who cannot afford health care. www.RedRover.org — RedRover provides a list including cancer, diabetes, kidney disease, cardiac disease and more. www.ThePetFund.com — Provides financial assistance for non-emergency veterinary care, up to $500 per applicant, for non-routine, necessary treatments. VPI Pet Insurance at www.petinsurance.com — Offers a variety of economical and comprehensive low-cost dog, cat, bird and exotic pet insurance policies. Delivered with a customer-first philosophy. ASPCA Health Insurance at www.aspcapetinsurance.com — ASPCA Pet Health Insurance was designed in conjunction with the ASPCA to offer financial coverage and benefits. 24PetWatch Pet Protection Services at www.24petwatch.com — Offers a variety of flexible programs with premiums (and deductibles). By selecting a comprehensive accident and illness policy you can make sure your pet has access to complete veterinary care. Pets Best Pet Health Insurance at www.petsbest.com — Pet insurance plans for dogs and cats that provide a high reimbursement percentage, offer a fast claims process and have no upper age limits. They also offer multiple pet discounts. Trupanion Pet Insurance at www.trupanion.com — Provides pet insurance with one simple plan, 90% coverage and no payout limit. Ease the Stress of Visiting the Vet! Call us at (207) 941-8840 to schedule an appointment. Click on the map for directions to our office!